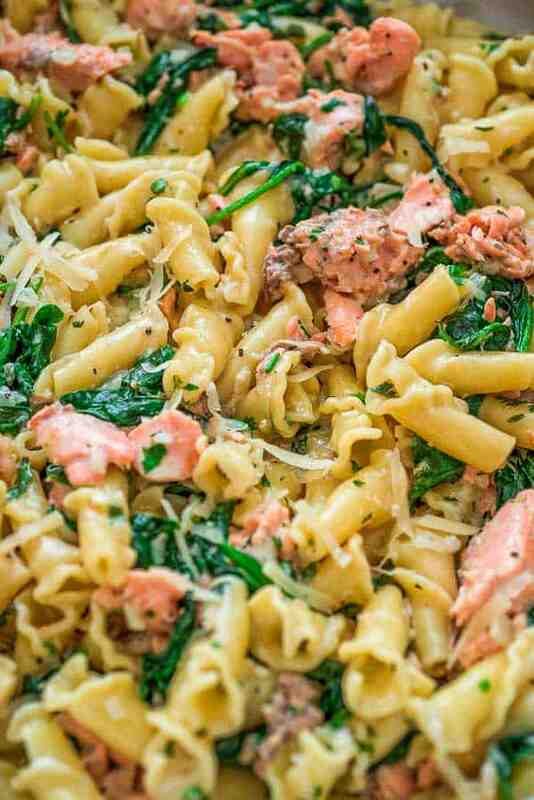 This Salmon Pasta with Spinach is a deliciously easy pasta recipe with chunks of tender salmon and spinach in a scrumptious, creamy Parmesan sauce! 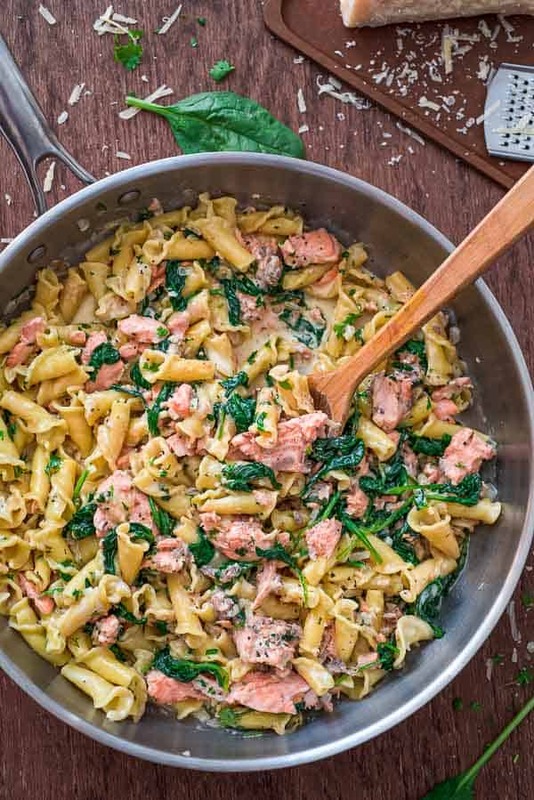 If you are looking for a quick, delicious, one-pot salmon dinner, you’ve come to the right place! 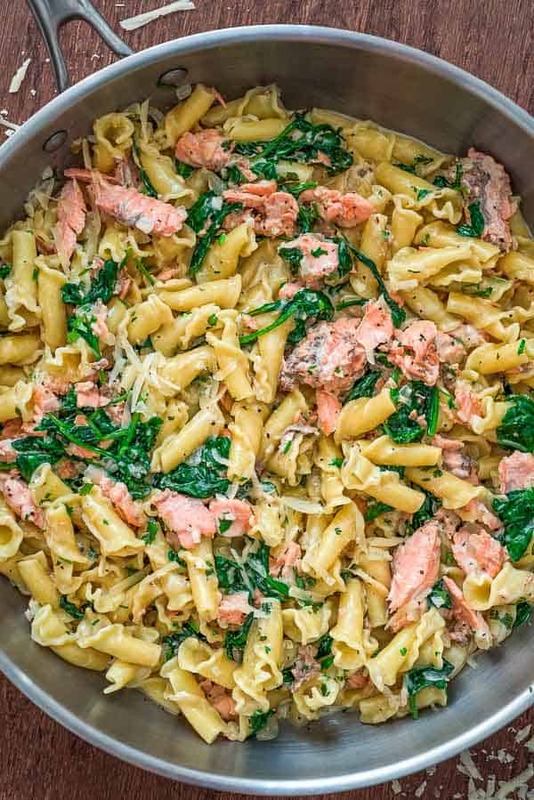 This Salmon Pasta with Spinach recipe is a staple in my family, and I am sure that after you try it, it’ll become a staple in yours. Made in under 30 minutes! Under the Country of Origin Labeling law, the USDA requires all retailers to list product origins and the method of production (farm-raised or wild-caught) for seafood. When shopping for salmon, choose a wild-caught variety, that appears moist rather than dried out, since moisture content is a great indicator of freshness and how carefully the fish was handled. Look for bright pink colors and avoid pale-looking fish. Your favorite kind! Seriously, use any pasta you love and have on hand. Penne, fettuccine, campanelle, ziti, and rigatoni are among my favorites. I would just recommend avoiding very small pasta varieties, such as orzo, stortini, ditalini, etc. Those are best for soups. I always recommend using fresh baby spinach. Is it tender and very tasty. You can always freeze the leftovers. The leftovers can also be used for smoothies, such as this Spinach Smoothie or Cherry-Spinach Smoothie. I stay away from the store-bought frozen spinach bags, because they have a lot of spinach stems, weird texture, and funny smell. 1. Cook pasta according to the package instructions. Meanwhile, sauté the onion in butter over medium heat for 4-5 minutes. 2. Add the salmon and keep cooking for another 5-7 minutes, breaking it into flakes as it cooks. 3. Add the spinach and cook it for 1-2 minutes, until wilted. 4. Add the heavy cream, Parmesan, garlic, salt and pepper. Stir and bring to a gentle simmer. 5. 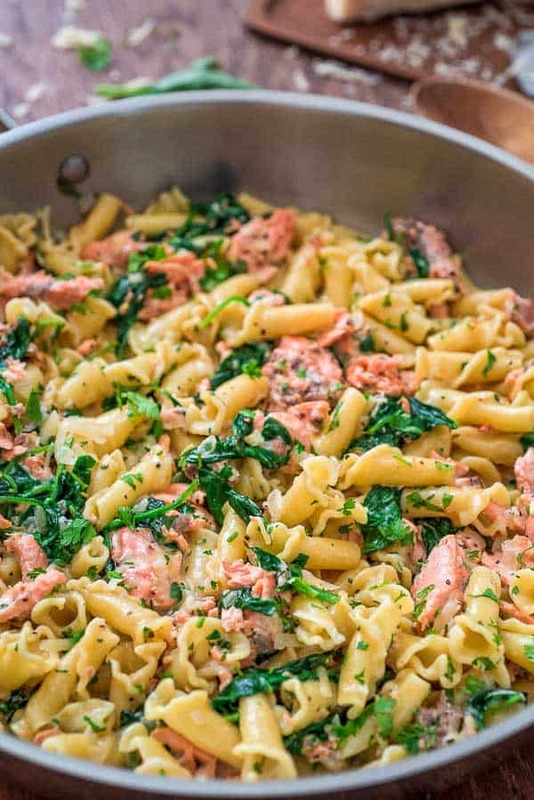 Add the cooked pasta and chopped parsley. Mix everything together thoroughly. 6. 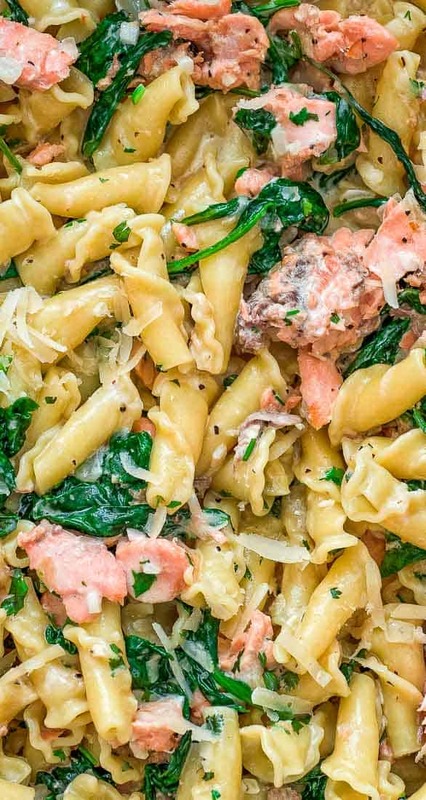 Garnish with parsley and grated Parmesan. Serve. Cook pasta according to the package instructions. 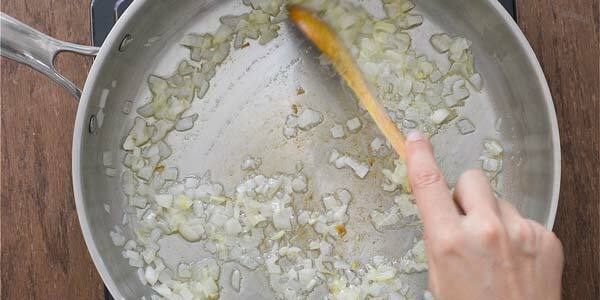 Meanwhile, sauté the onion in butter over medium heat for 4-5 minutes. Add the salmon and keep cooking for another 5-7 minutes, breaking it into flakes as it cooks. Add the spinach and cook it for 1-2 minutes, until wilted. Add the heavy cream, Parmesan, garlic, salt, and pepper. Stir and bring to a gentle simmer. Add the cooked pasta and chopped parsley. Mix everything together thoroughly. Garnish with parsley and grated Parmesan. Serve. This recipe is so delicious. My husband gets so excited whenever I tell him I’m making it for dinner. I’ve tried several of your other recipes and every single one has turned out great. Thank you! Thank you so much, Tammy! I am glad you enjoyed my recipes. Have a super day! 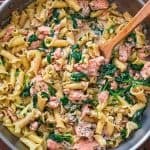 I love love love this recipe. Thank you for all your amazing recipes. Most of what I feed my family on comes from this site so THANK YOU!!! Awww.. That is so sweet, Julia! Thank you so much! Delicious!! My whole family loved it!! Can I substitute half and half for the heavy cream?? So good!! My husband was raving about it all night, my one year old had two helpings and my 3 year old even ate some (rare if it’s not pizza)! Thank you Tania. Delicios. I have tried. My son has Tried. Thank you so much, Malini! This was so delicious. Thank you so much for the recipe. Awesome! Thank you so much for sharing, Kathy! Happy Holidays!